I am very pleased to welcome back to GEI, Ms. Valerie Salembier, the Senior Vice President, Publisher and Chief Revenue Officer of Town and Country magazine. Prior to joining Hearst in 1996, Ms. Salembier had been Senior Vice President of the New York Times, President of the New York Post, Publisher of TV Guide Magazine and Senior Vice President at USA Today. She then was appointed SVP, Publisher and Chief Revenue Officer of Hearst’s Harper’s Bazaar and Vice President and Publisher of Esquire Magazine. While working in these positions, she was extremely involved in upgrading the two magazine companies by drawing in more advertisers and raising circulation. She is also very involved in many activities outside of the publishing world. Ms. Salembier has been Chair of the NYC Police Foundation since 2003 and a Trustee for 20 years. She is a global leader and spokesperson for the fight against luxury product counterfeiting. Since 2004, she created and has continued to host an annual Anti-counterfeiting Summit, featuring keynote speakers New York City’s Mayor Michael Bloomberg, New York City’s Police Commissioner Raymond W. Kelly and Juan Carlos Zarate, then Deputy Secretary of the Treasury for Terrorist Financing. In 2007 she introduced the Anti-counterfeiting Alliance to educate consumers about the human cost of fakes and the criminal activity tied to counterfeiting; child labor, terrorism and drug cartels. She has received numerous awards and honors, including the Women in Communication’s Matrix Award for Exceptional Achievement, one of the communication industry’s most prestigious honors. She was also the recipient of the Sales and Marketing Executives International Excellence in Marketing Award, the YWCA Academy of Women Achievers and the Jewish National Fund’s Tree of Life Award. She was also Concern Worldwide’s Woman of the Year in 2008, an organization that honors women of achievement for their contributions to public service. She was elected a member of the Committee of 200, an international organization of select leading businesswomen. She is also a member of the Women’s City Club, the Women’s Forum and Women in Communications. I have the great pleasure to have known Valerie Salembier for quite some time, and I have always admired her exceptional qualities and her outstanding leadership both within and outside of the publishing sector. 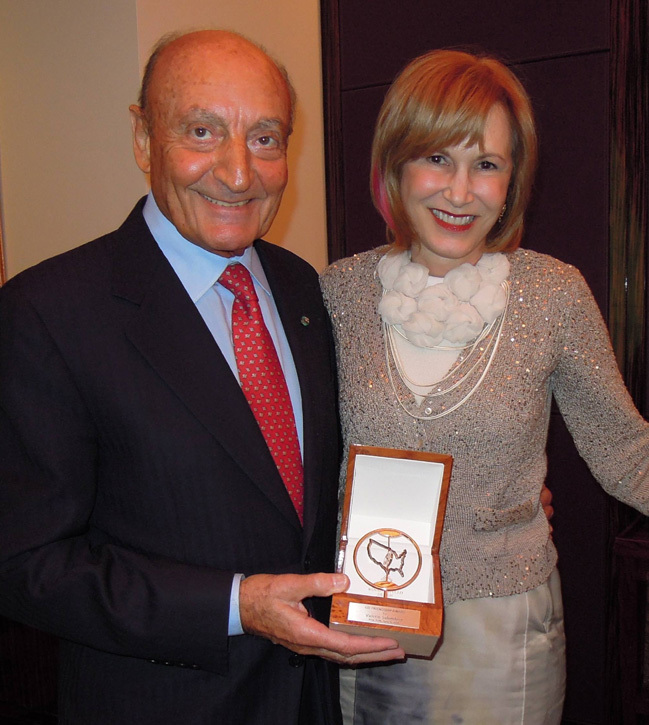 I am therefore very pleased to welcome Valerie Salembier and to present her on behalf of GEI with the “GEI FRIENDSHIP AWARD” in recognition of her many achievements. The luncheon was held on June 6, 2012 in the Stella Private Room of Le Cirque restaurant in New York City.